The diagnosis of ADHD increased 100 percent in just a decade. The percentage of kids who are overweight increased 100 percent between 1980 and 2002 (and increased 200 percent in teens). Is there a link between the two? Are kids diagnosed with ADHD more likely to be overweight? Or more likely to be underweight. It looks like the answer is yes to all three questions. 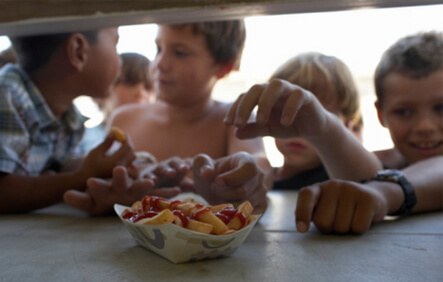 A large study of more than 62,000 kids and adolescents appeared in the July 2008 Pediatrics. The children who had been diagnosed with ADHD, but were not being treated with medications, had about 1.5 times the odds of being overweight compared to their non-ADHD peers. This is consistent with other research linking ADHD and being overweight. These investigators propose that the increased weight may come from increased impulsivity and decreased self control of the kids with ADHD both leading to increased eating, coupled with more time spent watching television or playing computer or video games, leading to decreased physical activity. In contrast, though, kids diagnosed with ADHD who are taking medications for their ADHD had about 1.6 times the odds of being underweight compared to their non-ADHD peers. Loss of appetite and weight loss are known side effects of some ADHD medications. To me, the causes and effects of these patterns aren’t so clear cut, but it makes sense for people caring for kids with ADHD to be paying attention to their weight: they may be at greater risk of weight problems than their peers. And it makes sense to pay attention to the behavior of kids who are becoming overweight: they may be more likely to have ADHD than their peers. Waring ME and Lapane KL. Overweight in Children and Adolescents in Relation to Attention-Deficit/Hyperactivity Disorder: Results from a National Sample. Pediatrics July 2008; 122:e1-e6.